Mac and Cheese is an easy meal or side dish to crave. Tender, fluffy pasta, coated in a rich, cheezy sauce. Well, one day, ok ok, many days, I get lazy about making dinner. Yes, even food bloggers get cooking fatigue! And though I absolutely adore my usual cheezy sauce, sometimes I want something that literally takes seconds to make. Lazy Mac’ to the rescue! Also check out the Instagram giveaway I am hosting this week..
Let’s clarify. By lazy, I really mean BUSY. Because we all have those long to-do list days, weeks, years. No shame in ‘laziness’ in the kitchen. In fact, some of the coolest, most clever recipes are those super simple ones! Recipes so easy and flavorful that we can’t help but make them again and again. I mean, PBJ anyone? So. Lazy Mac. Will you love it? The truth is, this recipe isn’t perfect. The sauce is really more buttery and cheezy than silky. So if you just want a rich, velvety sauce, you might want to take a few more minutes and make this recipe – or the one in my cookbook, HHVK. But if you just want FAST, bold, cheezy, buttery flavor – give this a try. I am super curious to hear if you love this recipe as much as we do. Leave a comment below or tag me if you give it a try! …Lazy Mac’ just may turn out to be all you need in a quick Mac and Cheese recipe! Two Ingredients. Nutritional yeast and vegan butter. The nooch adds the cheezy flavor and yellow color too. The vegan butter adds the richness and also salty flavor. Then you can add a non-dairy milk to taste to thicken and smooth out the sauce. * Hot Pasta. Make sure your pasta is super hot when adding the sauce ingredients! You want the heat from the pasta to ‘cook’ the sauce a bit. So drain your pasta and quickly add in the sauce ingredients while things are still hot and steamy. * Buttery. Use a vegan butter that you love the flavor of. There are a few on the market these days. I always use original Earth Balance – sticks or the tub. * Plain Milk. Use a plan or unsweetened non-dairy milk. Definitely do not use anything with a vanilla or sweet flavor. You want thing plain and creamy. Something with a rich consistency works best – no watery milks allowed! My fave brands for this recipe are Ripple unsweetened original or Eden unsweetened. Califia Farms unsweetened works well too. * Pasta. You can really use any pasta you’d like. Whole wheat, gluten free… You can even use different shapes like shells or even penne. Use what you have! * Add-ins. This recipe is perfect for add-ins. I love drizzling hot sauce over top to serve. Chopped greens or tempeh bacon is also yummy. I also love vegan sausage like Field Roast in this pasta. * Side Dish. I love this recipe served on the side of a salad at dinner time. It really makes a perfect quick savory side dish! * Sweet? So the savory flavor is pretty bold. And sometimes you may want a hint of sweetness to contrast that. I would advise adding 1-2 tsp agave syrup. Sounds weird, but it works. Or if you have it, a few tablespoons of a mashed sweet potato. And by mashed, I mean silky smooth, so that it blends well. 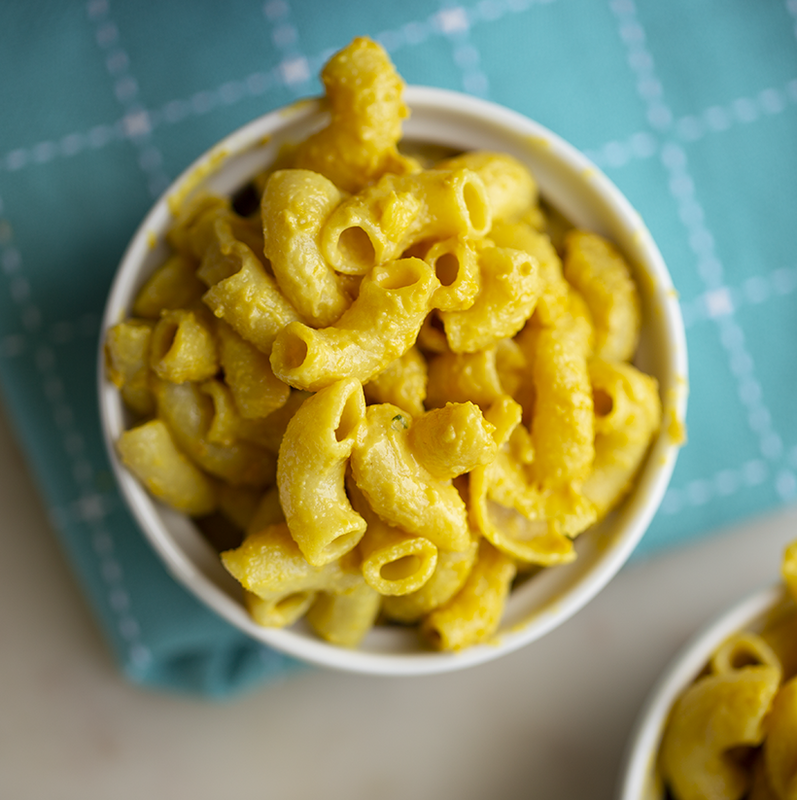 This super simple vegan Mac and Cheese uses just two main ingredients for the sauce. Add pasta a a large pot of boiling water. Cook pasta, until tender – usually around 7-10 minutes for basic macaroni. Add in the vegan butter, nutritional yeast and start with two tablespoons of non-dairy milk. Fold the sauce ingredients into the hot pasta. the heat from the pasta will melt the softened butter and warm the nooch into a creamier texture. Keep gently folding until the pasta is creamy. serve warm or store in the fridge until ready to serve. Tip: This pasta is actually even better the next day or as leftovers because the sauce smoothes out even more and soaks into the pasta. Prep Time: 00 hrs. 02 mins.Cook time: 00 hrs. 10 mins.